He confesses that he had lingering doubts and suspicion in regards to his success as a filmmaker because back in the early millenium there were not a lot of successful urban movies in the UK and coming from an African background he felt the need to have a back-up plan because doing work in the entertainment industry wasn’t seen as a good career move nevertheless he pressed on citing the film “City of God” as his greatest inspiration as an aspiring filmmaker. Today the founder of Oakmanfilm is making waves both home and abroad and has worked on numerous shorts, and supporting artist roles including Beeban Kidron’s ‘Hippie Hippie Shake’ which also starred Sienna Miller and Cillian Murphy. 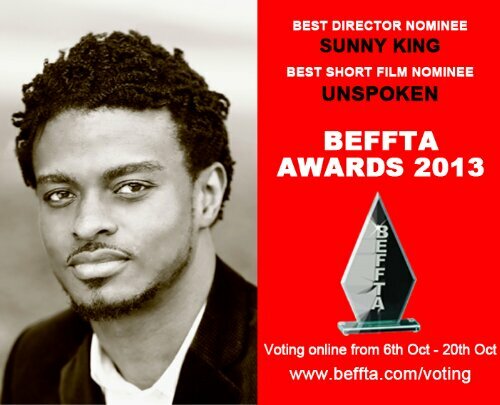 Sunny King was runner-up on Project talent UK 2007 and had his first short film ‘Signs’ was selected for the Woodgreen International Film Festival 2009. He also won the GMA awards for Best International Music Video 2011. His latest production called “Unspoken” was screened at the premiere of Nollywood movie “Last Flight to Abuja” and was a resounding success. It was one of the top 10 finalists out of 526 short films worldwide at the Afrinolly short film competition and has been featured in several film festivals like the Buff Film Festival, Africa in the Pictures Festival, Film Africa London Independent Film festival, Cinema Africa in Sweden and the 6th International WAMMFEST Women and Minorities in Media (USA). Sunny King believes in these 3 words- ‘Short, Subtlety and Simplicity’and these are words that aptly describe the films he produces. UNSPOKEN is already being developed into a feature and has gotten quite a lot of recognition. It won Best Film at the London independent Film Festival 2013 and was nominated for best Short movie at the Nollywood Movie awards 2013, Best Short Movie at the NAFCA AWARDS 2013 and Best Director and Best Short Film at the BEFFTA AWARDS 2013. Voting for the Black Entertainment, Film, Fashion, Television and Arts Awards (BEFFTA) is ongoing. 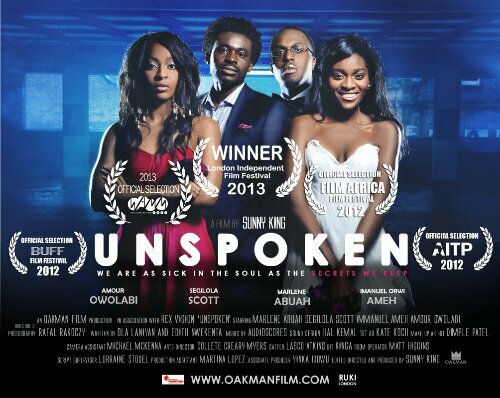 Please click on the link below to vote for ‘Unspoken’ in film 1 and film 9 category for Best Director and Best Short Film. Watch his first short film ‘SIGNS’ here.